I've bought a couple of Marina Warner's in the last couple of years but not quite got round to reading them yet - they're imposing looking things which will clearly demand both time and concentration neither of which are always easily come by. 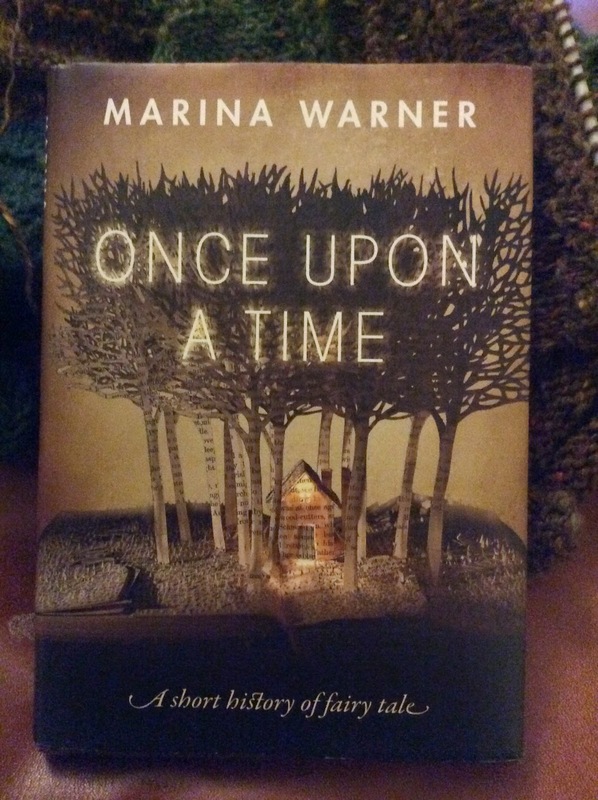 When OUP sent me 'Once Upon a Time' I was delighted not just because I'd already had my eye on it but also because it keeps it's promise of being short. It's a delightful pocket sized book with a 180 pages of text (with almost 20 more of further reading and index) and illustrations which break down into very manageable chapters. A serious book that arranges itself in such a way that it can easily be read on buses and tea breaks is a precious thing especially when the gaps between reading allow a good bit of time for consideration. 'Once Upon a Time' is basically a lecture series; each chapter is broken down into further subheadings and each is an introduction for more reading and research. I find the best way I can describe it is as a map of the fairy tale world - there are dozens of paths to explore, all helpfully signposted (each chapter has it's own comprehensive reading list) and all in a style sufficiently accessible to make those unread books by Warner seem much less daunting. Fairy tales are such an integral part of childhood that it's impossible to remember a time before familiarity with Sleeping Beauty, Rapunzel, Cinderella, Rumpelstilskin, Beauty and the Beast, Hansel and Gretal and so on. Hans Christian Anderson came into my life a little later but his stories (I'm thinking of the little match girl and the red shoes specifically) were so depressing that I didn't much enjoy them as a child - but bits of them are still embedded in my memory. I'm equally unclear as to how they entered my life as an adult, probably through A.S. Byatt and Angela Carter but I think I started to take an active interest in fairy tales at about the same time I became interested in food history. It's domestic (rather than restaurant or proffesional) cooking that interests me - the sort that connects you to generations of cooks before you, sets a rhythm to the day, and captures something of a places history in it's combination of ingredients - some local, others imported, and always evolving. Warner argues that fairy tales reflect the every day reality of the people who told them without specific reference to history - though there have been efforts to tie some of them to actual people (Snow White and Bluebeard) they remain to elusive for that. The great thing with fairy tales is their adaptability. The stripped down, darkly violent, tales the Grimm's finessed out of their collectings didn't even remain static in their own books but were constantly edited into ever more refined versions for later editions - and haven't stopped since. Helen Parry (from 'a gallimaufry') wrote an excellent review of 'Once a Upon a Time' for Shiny New Books Here, I agree with her that this is a book to treasure. It really is the perfect introduction to the subject, as well as being a very good introduction to Warner's work generally. I've ordered a couple of books from the reading list for further exploration and am revisiting some I already have. It's been an invigorating, inspiring, start to my reading year. The latest edition of Shiny New Books has been posted including a contribution from me recommending Sarah Randell's 'Marmalade'. I know I've written about it a couple of times already here but whilst both blood oranges and seville's are available - neither are around for long- and the weather is such that a day in the kitchen is a really attractive prospect then there could not be a better time to explore this book. 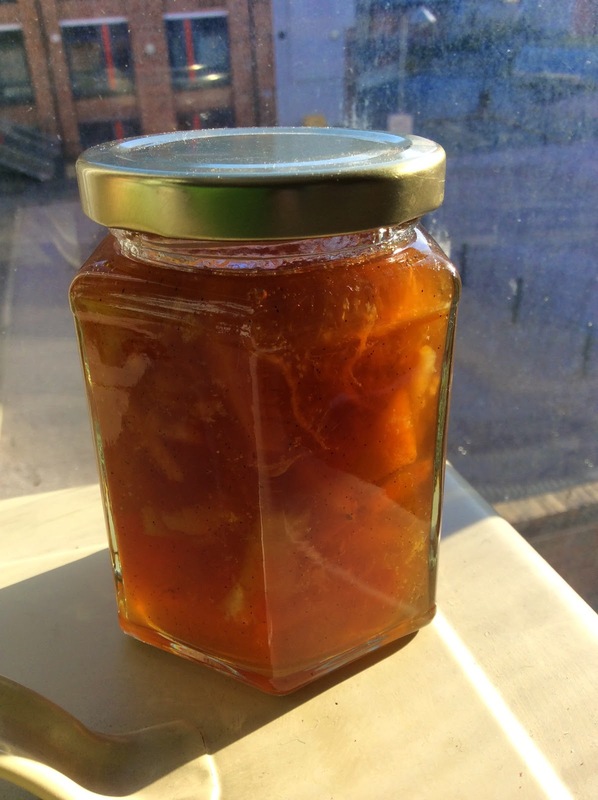 It's not just about making marmalade but suggestions for what you can do with it beyond slathering it in toast (indispensable if, like me, enthusiasm for making it far outstrips breakfast demands). 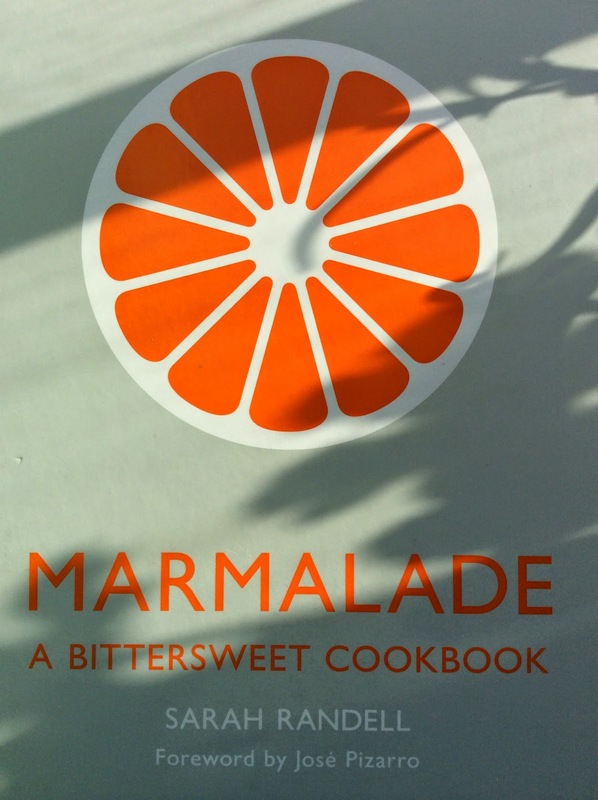 'Marmalade' Here and of course much, much more from a Shiny New Books too. I wish I could say that my preserving habit was under control and that I could stop at any time but it looks a lot like that would be a lie. Inspired by Sarah Randell's book and the appearance of blood oranges I've been making blood orange and vanilla marmalade, toast and marmalade tart, and today there is the intention to make Seville orange marmalade - I have the oranges but am short of jars, unfortunately I'm even shorter of freezer space. It's not my finest moment organisation wise. Randell uses bramley apples (presumably fir the pectin?) in her blood orange marmalade which I didn't have so instead I used Pam Corbin's recipe from a River Cottage handbook as a starting point. 1 kilo of fruit, 2 kilo's of sugar (1 granulated, 1 demerara, a sachet of pectin for each to be sure of a good set) 100mls of mixed lemon and lime juice, 2.5 litres of water, and a split vanilla pod later I had a 11 jars of marmalade - more than anticipated. Just as well it's good. add the juice of a lemon (grated zest optional, my lemon had reached an age where whilst still juicy on the inside it was somewhat wizened on the outside so zesting was pointless), the toasted bread crumbs, about 40mls of double cream, and a beaten egg. Fill the tart case and bake at 180 - 190 degrees C for half an hour or until done. Randell also uses a pinch of ginger, but it's not something I'm over fond of so I haven't. Her book is excellent, I really recommend it. I'm not celebrating Burns night in any particular style this year - the prospect of an early start and work in the morning makes even mild whisky consumption feel unwise. Burns night isn't the same if you can't drink enough to be grateful for a slow start to the next day (by which I mean roughly one drink more than is sensible or just enough to make declaiming poetry in a dodgy Scottish accent in mixed company fun - not all out debauchery, and certainly nothing that would lead to a hangover). Still it was the extra prod to make this tart - my pudding of choice post Haggis has been a rhubarb cranachan which is great but this fulfils my Burns menu criteria even better. 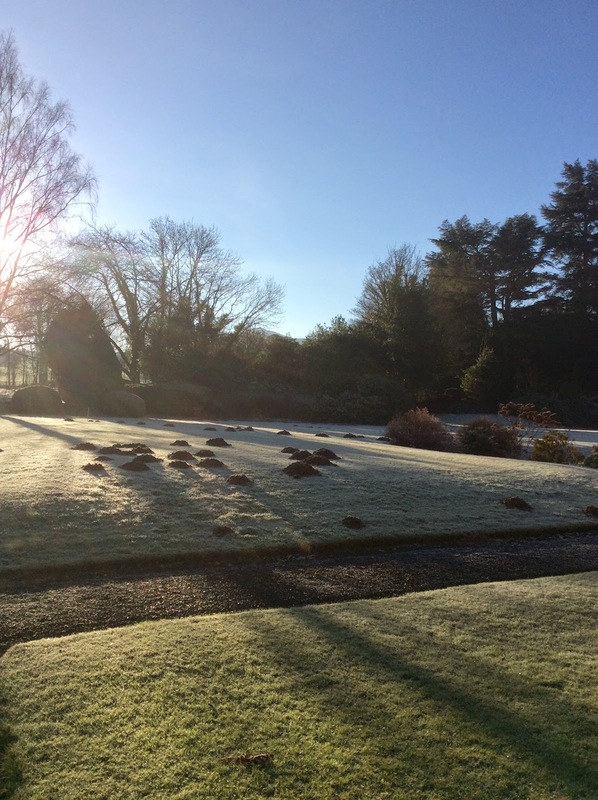 For me the point of Burns night is that you get something to look forward to at just the stage of Winter when you need it most; the dark nights and mornings may be receding but it's still a good month before we can really think of spring being properly on the way. The other great thing about it is that it can be done on a tight budget and is all the better for it. Haggis neaps and tatties couldn't be less demanding to cook, and in short I can't think of any other dinner or party that's easier to throw together. This tart combines the virtues of taste (it's delicious), good looks (it's glowing golden colour is very cheering), and economy. It's also simple to make with no last minute demands so you're free to enjoy the company of friends and possibly a small dram. Some books have to come to you as presents; books you quite want but somehow hesitate to buy because there's always something more pressing, books that languish on wish lists because you can have 3 paperbacks for the same price, books that are a subtly different form of self indulgence to the ones you normally buy. (I accept that this might be just me.) 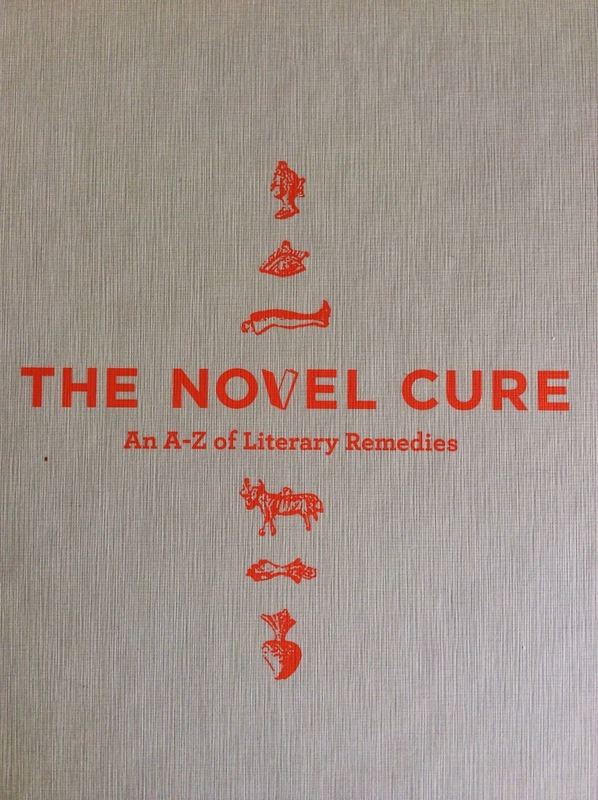 in my case these books are invariably reference of some sort and 'The Novel Cure' is the perfect example. As it turns out the generous doner of this particular volume felt the same way about. Are some books always destined to be given as gifts? Anyway I'd had my eye on it for a while before my (dear) friend took the hint and gave it to me for Christmas. It's full of things I like - descriptions of books, lists of books, amusing index based jokes - and is not one of those 1001 whatever's you gave to do/try/see/read before you die affairs which I loathe with a totally irrational passion. Berthoud and Elderkin (presumably still) run a bibliotherepy service which, if I understand correctly, matches readers to books, which sounds sort of fun and also something that could only thrive in places like London. The charm for me in this book is in the A-Z index of things that you might want a cure for. I like a good index (I can't afford to go out much so have to make my own fun) and this one is enjoyably tongue in cheek (occasionally laugh out loud funny). There are also top ten lists (does anybody ever look at those without violently disagreeing with 8 out of 10 books on it? ), plenty of sensible advice (which I'm unlikely to take) about controlling book buying habits and other common problems that beset compulsive book buyers and readers. There are also hundreds and hundreds of recommended books, a fraction of which I've read. As far as the rest go there's another fraction I might read but the bulk of them will probably never come my way or ever entice me out of my way to find them which doesn't in the least effect the pleasure of reading about them. Dipping in and out of 'The Novel Cure' also has the feeling of browsing somebody else's library, which is another pleasure. The selection is suitably eclectic so if this were a library it's one I'd very much enjoy spending time in. In short it's a perfect bedside book and a very good present indeed. I learned to knit at primary school, where we had weekly lessons with a lovely woman called Zena, and when it was accepted as a matter of course that all girls would learn to knit, cook, and sew in much that order. I think the boys were let off in favour of something more manly to do with a boat but I'm hazy about the precise details now. What I do remember is enjoying those lessons so I'm not sure why it's taken me 30 years to pick up a pair of needles again, but it has. I've had some vague idea about embarking on some sort of knitting project for at least a couple of years now, indeed have sometimes felt like the only person I know who doesn't knit but what really tipped the balance was buying wool for my sister last summer. It just came in so many gorgeous colours (our preferred brand is Jamieson's ) that whilst I was choosing greens for her as per instructions I couldn't resist buying some for myself too. It's taken six months but I've finally given up on the idea of persuading my sister to knit things for me and taken her up on the challenge to do it myself instead. She has always been much better with anything textile based then I am, she can sew in a straight line for a start, and is infinitely more competent at both following and devising patterns. If nothing else my attempts will provide her with some comic relief. In a spirit of optimism I went out and bought some needles and a book yesterday (the needles turned out to be to small a gauge which was the second thing that amused her). The book was chosen because it looked to contain clear instructions on all the things I would need for the very specific project I'm working up to, was the most sensible size, and also the cheapest. So far it hasn't disappointed. After an hour of vainly trying to remember how to cast on I read the instructions properly and managed to do it without any further difficulties. (That was the first thing sister found hilarious.) It only took twenty minutes to crack purl stitch and after that I spent a happy enough evening practicing stitches and the like. It was slightly disconcerting to realise after a couple of rows that I'd managed to gain several stitches (seems that was funny too) but that seems under control for now. My plans for knitting are fairly modest, for now it's quite satisfying to rediscover a forgotten -I want to say skill but think that might be overstating my abilities - so should perhaps settle for saying it's good to rediscover something forgotten. Please wish me luck. This is the second Penelope Lively I've read - I really didn't enjoy the first one (Making It Up) but thought I should give her another go as so many people who's judgement I trust admire her. When 'Oleander, Jacaranda' came my way I admit I wasn't overly enthusiastic about reading it - which is hardly the ideal way to approach a book - but eventually got on with it anyway. It's another sort of biography. Where 'Making it Up' was an exercise in imagining what might have been (but less fun than that sounds) 'Oleander, Jacaranda' is part autobiography part meditation on the difference between adult and childhood perceptions. It sounds like the sort of book I should like. That I didn't particularly enjoy it is almost certainly because I cannot warm to Lively as a personality and to read an autobiography with any pleasure I suppose you have to either admire or like the author (or dislike them so much you can enjoy having all your prejudices confirmed). I haven't read enough of her work to develop any admiration for Lively as a writer which was a handicap that her voice in this book didn't overcome; if anything it was the opposite and I was strongly reminded if people I've found tedious at dinner parties - and from there it's all down hill. That's not a very rational response, though it's one reason why I don't read many biographies and actively avoid them when it comes to favourite authors - you can't escape into a written world quite so happily if it's creator turns out to be obnoxious. Not that Lively comes across as obnoxious , she really doesn't, but the world of an only child who spends most of her time alone or with her nanny/governess felt quite claustrophobic to me as a reader. There are things she has to say about the nature of time and distance, homesickness, and culture shock that resonate but overwhelmingly there is a sense of self absorption - which is basically the point of the book. Lively is looking at her own memories much as an archeologist might examine physical remains and trying to fit them in to the known history of the period. In this case war time Egypt. For the most part her recollections are of smells, colours, and the general texture of her own every day life against which the war makes very little impact - and why would it. Overlaid on the original impressions are layers of created and shared memory that come with hindsight and the telling of stories and all the inconsistencies they bring. In theory these are themes that are right up my street, and when I made myself get on with the book I found enough of interest to make finishing it fall short of the chore I feared it might become but in the end there was no spark. I don't think I'll be trying Lively again, at least not anytime soon, she's better left to those who do find the right chemistry with her writing. Mackenzie is best known for 'Monarch of the glen' (much better than the TV series, or at least nothing like the TV series and very good) and 'Whisky Galore' (made into what is probably my favourite film of all time) but he wrote almost 100 books a few of which I've picked up over the years. After watching 'Whisky Galore' over Christmas and still being in the mood for something Island based after 'A Tangled Web' it seemed the ideal time to search that pile for something appropriate. 'Keep The Home Guard Turning' must have been popular in it's day as my copy is the 5th imprint (1951) of a book first published in 1943, 2 years after 'Monarch of the Glen' and eventually using some of the same characters. 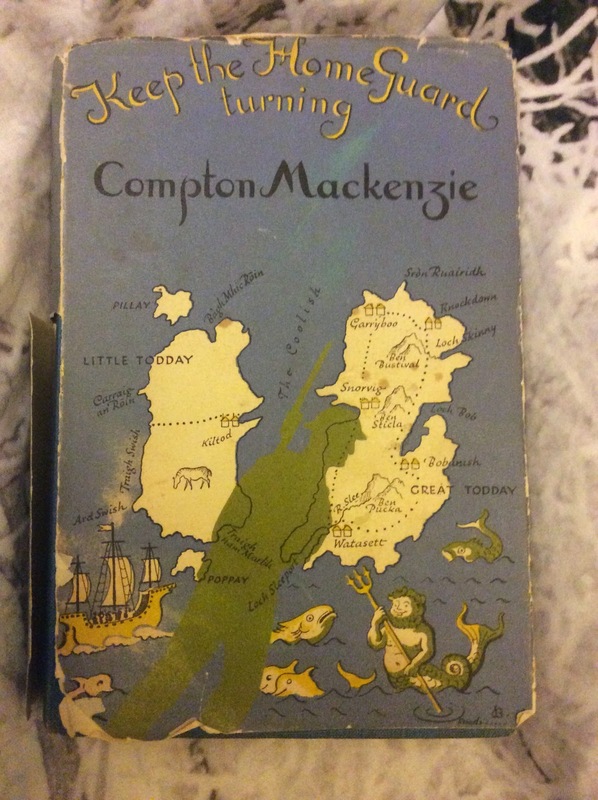 It's set on the same (fictional) Todday Islands as 'Whisky Galore' (written in 1947), my guess is it delighted Mackenzie to have the opportunity to go back. I had some idea that this was a collection of short stories, it's not. What it is, is a meandering comedy that gently mocks the excesses of war time bureaucracy, and perhaps less gently mocks a certain sort of Englishman. Mr Waggett has taken on the big house on the islands and the sporting rights (to the total indifference of the locals) which gives him the impression that he's the laird. He's also taken on command of the home guard. There is much that could be said to the detriment of Mr Waggett but the most damning point is that he likes his whisky with sweet fizzy lemonade added. In the end very little happens but it doesn't happen in an amusing enough fashion to make the book very enjoyable, more especially if you have a fondness for the west coast of Scotland. What it has in common with 'A Tangled Web' is a genuine affection for a place and people and a delight in the absurd. For the islanders much of the war is absurd - it's pointless rules and regulations because when all is said and done they're very far away from the frontline. Their sons may be in the merchant marine, their daughters heading off to the mainland for jobs in factories, but back at home everything is much as it ever was - even rationing has a limited impact on people who live off the land (with maybe the odd poached grouse) and the sea (no shortage of lobsters) and are perfectly attuned to that way of life. For fans of Monarch or Whisky Galore this is well worth picking up if you come across a second hand copy somewhere. It was certainly a very enjoyable way to spend a cold wet January weekend. I really don't understand what the good people at Hesperus were thinking when they chose these covers; they are appalling to the point of being off putting, nor do they reflect the nature of the books, it's hard to express how much I dislike them. 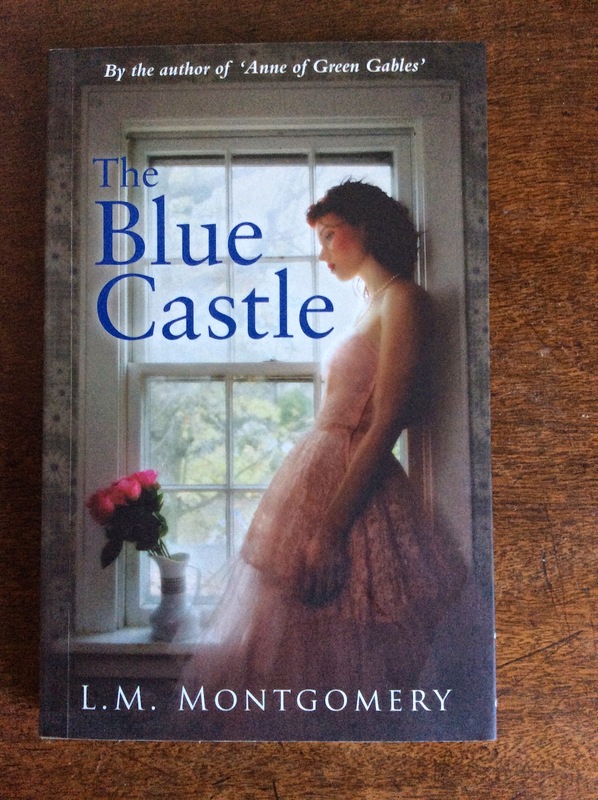 'The Blue Castle' is a slight but very enjoyable sort of Cinderella story, 'A Tangled Web' is something more substantial. It's also an absolute delight. 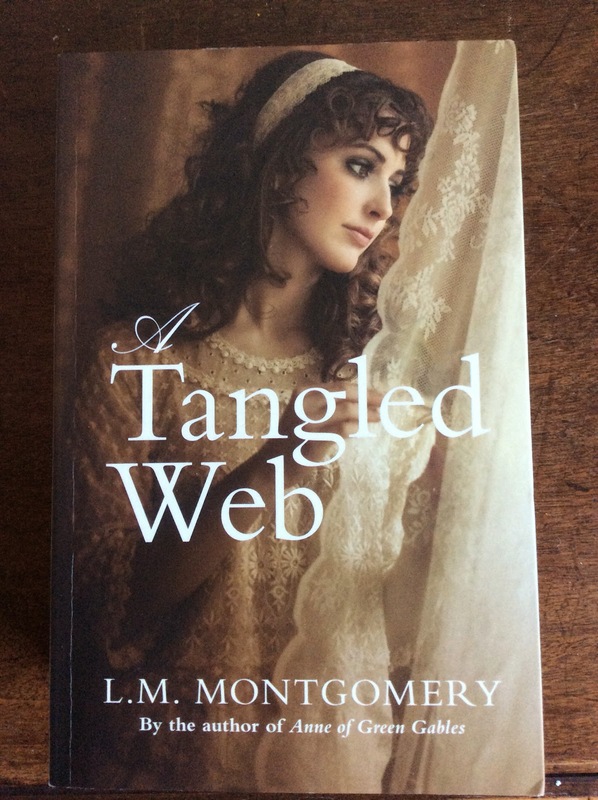 It's set on Montgomery's beloved Prince Edward Island and is the story of the Dark and Penhallow family - over 3 generations 60 Darks have Married 60 Penhallow's creating a very tangled web indeed. There are all the petty feuds, grudges, alliances, friendships, loves, and scandals you might expect and all conducted under the watchful eyes of a clan that make secrets hard to keep. Aunt Becky who is by way of being a clan matriarch (she knows all the things people would rather she forget, and is very happy to remind them - and everyone else - of just what she knows) having buried her husband and all her children is finally ready to die herself but she's got two things to do first. There is the serious business of deciding who will be left the Dark jug, and a last chance to put everyone in their places. A clan gathering is called where we meet the family and the jug. The jug was once the property of a Harriet Dark back in England, it had been a gift from a suitor who proceeded to die at sea. In due course it travelled to Canada with Harriet's sister who broke and mended it, and in the process became a treasured heirloom with a romantic edge. Ownership clearly confers a certain honour and status on a person, and in a family so intertwined almost everyone has a claim. They're all also willing to fall out quite spectacularly over it. Aunt Becky has her fun at the family's expense before declaring her decision won't be finally announced until a year after her death, a cousin is appointed as guardian of the jug and also adjudicator of family behaviour and then within the week Aunt Becky is gone and we can follow the affairs of the rest of the clan as they unfold. Generally though it's the combination of acute observation of human nature and gentle humour that make this such a joy. It's a gentle meandering sort of book which I absolutely didn't want to end with so much detail that further readings are bound to reveal more. There are so many books which I intend to read again, but only a handful that I know I'll turn to again and again - this is one of them. A book that could be summarised as being about a man who reads a lot of books about boys meeting girls, or sometimes girls meeting boys, who himself meets an e reader. 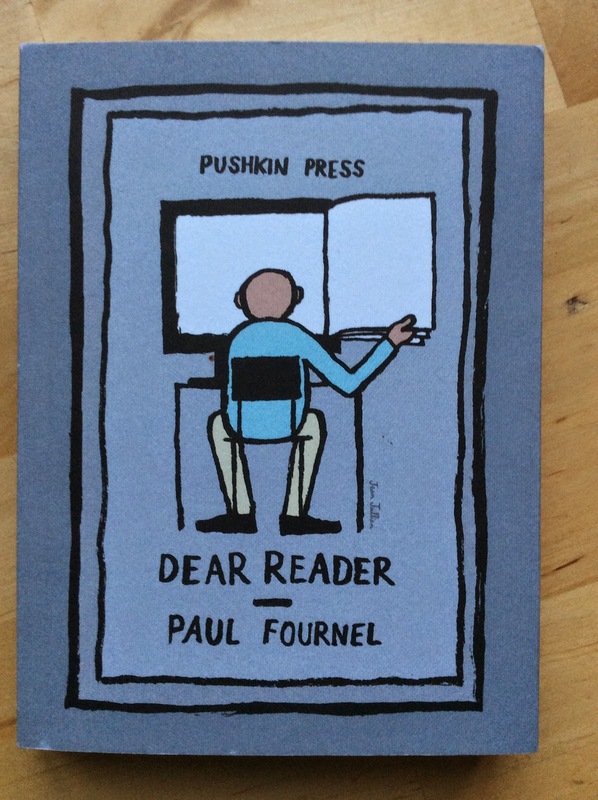 Or as the inside cover has it "...a wry, affectionate look at the world of publishing, books and authors...a very funny, moving story about the passing of the old and the excitement of the new." It was originally published in French in 2012, translated and published by Pushkin in 2014 so is fairly contemporary but perhaps because it deals so specifically with a moment in publishing history it already feels like, well, like history. Robert Dubois has spent his career refining, amongst other things, how he reads a paper manuscript. The advent of his reader is discombobulating but eventually they become used to each other. At which point it's replaced with an upgrade. I read this book at the same time as a clutch of media articles about how well Waterstones is doing selling books on the high street and how ebook sales have plateaued which added to the sense of reading about a moment that had already passed - 'Dear Reader' has plenty of young people getting very excited about the possibilities of various apps and a corresponding number of middle aged people who range from baffled to entranced by the new technology. My own feeling about e readers is that they're not for me, partly because it feels like technology destined to go the way if the mini disk and I resent the pressure to upgrade an expensive device every few years and mostly because I like books. I like them as objects, I like looking at a shelf of them, I love going out to shop for them, and all of that is before I even get to content. Like Dubois in this book I have come to see the point of e readers even if I will never own one. This is an engaging snapshot of the publishing industry as it catches up with the possibilities of new technologies, it's also a book that gently nudges it's reader to consider their own relationship with books both for their contents and as possessions. January perhaps isn't the ideal time to write about such specifically Christmassy fare - it is after all 10 months before it's time to think about it again but I'm so excited about how the puddings and chutney turned out that I really feel the need to share the results. I only wish I could share the actual food. The Christmas chutney came from Diana Henry's brilliant 'Salt, Sugar, Smoke' - everyone who has tried it has been enthusiastic, two of them have requested the recipe. 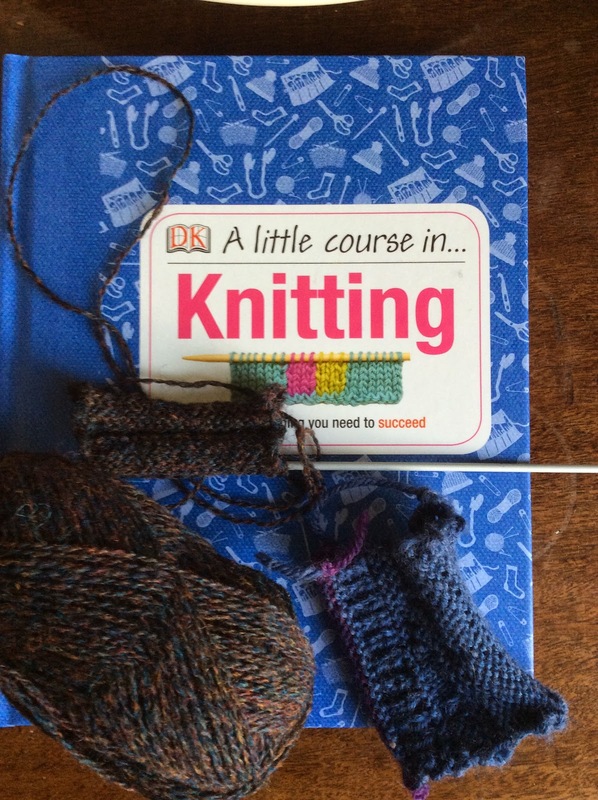 I can't recommend this book highly enough, it's one I keep going back to - it's not just that everything in it works brilliantly, but everything I've made from it has since been made again and again. There are a number of books about on preserving, there's at least one other that I'd recommend (the River Cottage handbook by Pam Corbin) but 'Salt, Sugar, Smoke' is the indispensable one (buy it if you don't have it!). The Christmas chutney is filled with fresh and dried cranberries, dried cherries, dates, prunes, raisins, sultanas, cinnamon, mixed spice and other good things. It proved excellent with cheese, pork pies, cold meat and the like. I'd been waiting since late October to try it, it most certainly didn't disappoint. The thing that had put me off making chutney for so long is the same thing that put me off making Christmas puddings in the past - they take such a long time to cook. With the puddings this feels like even more of a commitment than the chutney because they require hours more boiling again before eating. It's one thing to spend hours cooking a thing in early November but quite another to contemplate doing it all over again on the same day you have so many other demands on your oven. Turns out it's worth it. I used two recipes from Dan Lepard's 'Short and Sweet', two because I had plenty of dried fruit to use up and wanted one for our family gathering and one to send away with D for his. I ended up with three puddings due to bowl size which meant that I got the chance to try both. Both were good but I know which one I'll be making next year. I can only remember having shop bought microwaved puddings so homemade was something of a revelation. They're much lighter and juicer than anything I've had that's been through a microwave and now that I've adjusted to the idea of cooking it properly it turns out that sticking something into a pan to simmer isn't really so much effort. The winning pudding was the 'Simple Christmas Pudding' based on a 1930's recipe. It may not be the ultimate in puddings but we were all more than impressed with it. 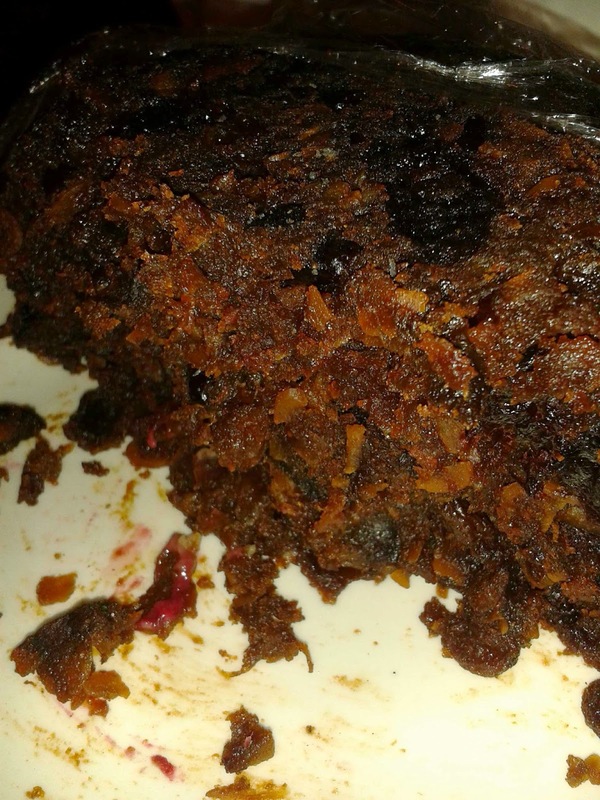 It serves 6 -8 and contains 400g of mixed dried fruit including prunes, 75g suet, 200g muscovado sugar, 100g black treacle, 125g breadcrumbs, 50g plain flour, half a teaspoon of baking powder, 2 teaspoons of mixed spice, 1 teaspoon ground nutmeg, 2 beaten eggs, 50g grated carrot, 100g blanched almonds, zest and juice of a lemon and an orange (unwaxed), and 125mls of stout. Mix everything together, butter an 18cm diameter pudding basin and place a disc of non stick baking paper in the bottom of it. Fill the basin and then take large squares of baking paper and foil, place then together, fold a pleat in the middle and with the paper pudding side tie them securely round the lip of the basin with some string, trim the foil so it doesn't come to far down the basin. Either make a handle of string or wrap the whole lot in a square of muslin so you can lift the whole lot in and out of the pan. 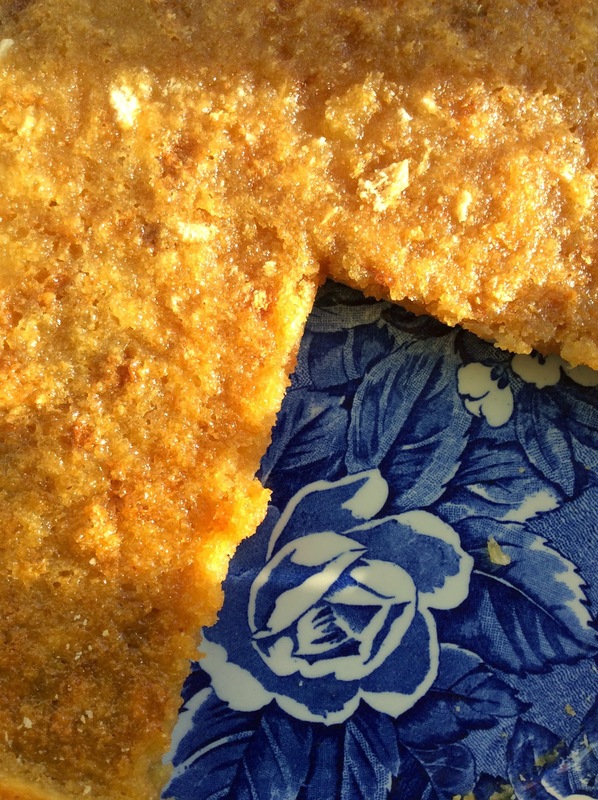 Find a large enough pan to hold the basin which needs to be placed on a trivet or old upturned saucer, pour water half way up the sides (don't let it touch the foil, it leaves nasty marks on your pan) and summer for 3 hours. Diverging from Lepard's instructions I uncovered the pudding after cooking and cooling so that it could be fed weekly with a liberal amount of drambuie before covering it with paper and foil again for it's final 3 hours boiling on the day of use. New year new beginnings and all that sort of thing. I'm at the end of 10 days off work which has been wonderful. The last couple of months of 2014 really got on top of me, some particular combination of work and personal circumstances suddenly felt like to much altogether. Happily a bit of time off feels like it's done the trick, and even when I go back to work the demands of January are not so overwhelming as December's. A few days in the Scottish Borders (very large sofa, log burning stove, beautiful countryside to look at from the sofa, affectionate dogs, great food, even better company, and plenty of reading time) provided a wonderful end and beginning to 2014 and 15 respectively. 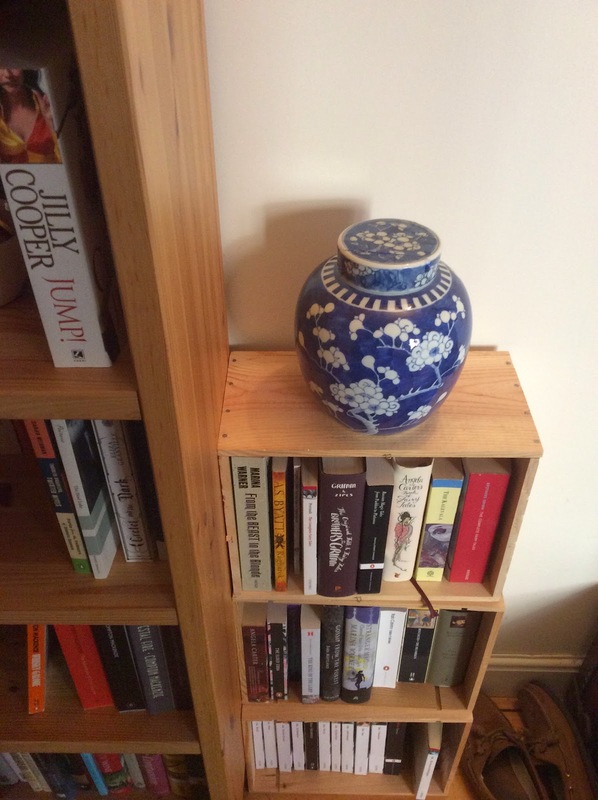 Meanwhile I finally rescued some wooden wine boxes from work to make some makeshift bookshelves with - I could wish they were smarter but they're extremely practical. 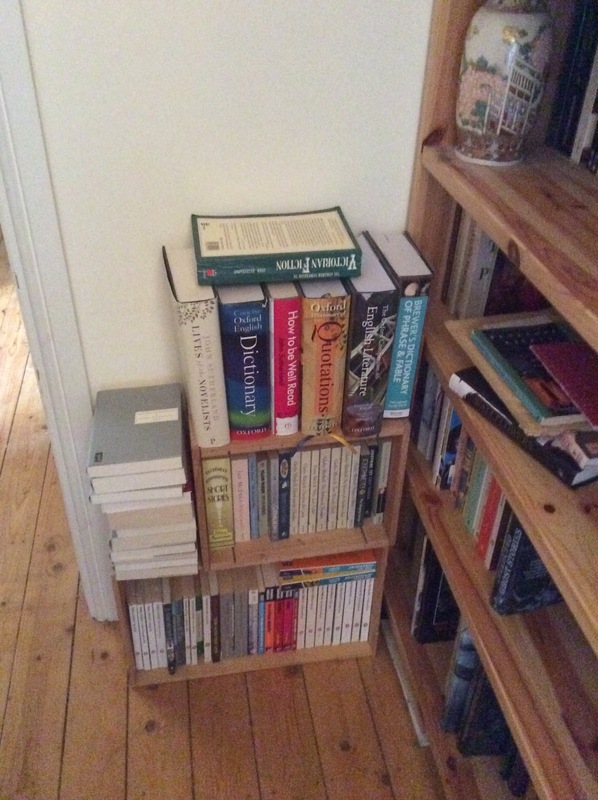 They're easy to fit into odd corners, easy to move around, and whilst I still have more books than shelf (lots more books than shelf) a happy evening moving a few things around has bought me closer to some sort of order. Most of my fairy tale related books (though not fiction with a specifically fairy tale theme -that's a dream which will have to wait) are now together. A couple more boxes and mythology can join them which will be extremely satisfying. Crime fiction has been better divided into golden age and noir as well which will make matching book to mood a far quicker task (nothing to gritty or modern here) and a few books are off to Oxfam. The best bit of rearranging - even on such a minor scale - is finding things I'd forgotten I had. 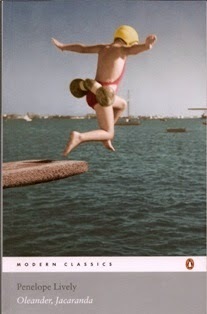 As for bookish resolutions for the new year, I have a few. As this is Trollope's bicentenary I will at the very least finish the Palliser books (2 left). I read 3 Zola's last year which feels about right, another 3 this year will see me just over a quarter of the way through the Rougon - Macquart cycle which is manageable. I also mean to be rather better at letting go of books I don't want/won't read again, that's not many of them but when space is precious I have to question if I'll ever really read my way through a yard of letters from assorted Mitford sisters.